The explosions are amazing, and its fun in short bursts, but Just Cause 3 is ultimately an unremarkable, shallow experience. What is it? An open-world action game about destroying a dictatorship. The explosions in Just Cause 3 are really, really good. They’re elaborate, extravagant eruptions of fire, debris, and smoke. And when you blow something up, the ensuing fireball spreads to other objects around it, triggering a massive, destructive chain reaction. It’s a brand of fiery devastation that Michael Bay would describe as ‘too much’. But that’s about it. When the fires burn out, the smoke clears, and the dust settles, you’re left with a simplistic, one-note, and strangely dull open-world action game. Rico Rodriguez returns as the game’s protagonist, and seems to have, over the course of three games, slowly transformed from Antonio Banderas into Nathan Drake. And this time he’s liberating Medici, a picturesque chain of sun-soaked islands in the Mediterranean controlled by a one-dimensional cartoon dictator called Sebastiano Di Ravello. This sadistic, egotistical despot rules the country with an iron fist, and it’s your job to dramatically blow up that fist. 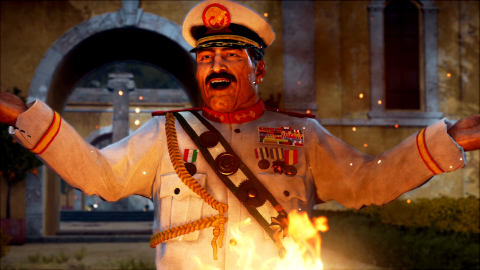 Rico has always been a man who smirks in the face of physics, but in Just Cause 3 it’s a hearty belly laugh. A new gadget, the wingsuit, lets you soar majestically across the map, and it’s brilliant. You can keep going basically forever by shooting your grappling hook at the ground and pulling yourself forward. It makes no sense whatsoever, and is one step away from straight-up flying, but combined with the old grapple/parachute combo, moving around Medici is always hugely entertaining. Di Ravello’s hold on the islands is represented by enemy-controlled towns, airports, military bases, radar installations, prisons, and other locations. The general rule is, if it’s red, you have to destroy it. By reducing these areas to rubble, you win territory back for the rebels. Blow up every enemy settlement in a region and it turns blue on the map, indicating that you’ve driven the enemy away completely. Your ultimate goal is to take control of all of Medici and oust its dictator. A just cause indeed. But it’s not long before it starts to feel like a chore. Every enemy base has a long shopping list of objects you need to destroy—fuel tanks, generators, radar dishes, etc. And you charge around chucking grenades and launching rockets until every red thing has been checked off. The explosions are amazing, but they’re a distraction. A fireworks display. Compare this to the rich, interlinking systems of something like Metal Gear Solid V, and you realise that Just Cause 3 has no depth at all. But, being a sandbox game, you’d think I would be able to just avoid this stuff altogether and find something else to do. There are story missions—in which you’ll find some genuinely memorable, imaginative set-pieces—but they’re often locked until you free a certain amount of territory on the world map. So to advance the story and see the next exciting thing, you’re railroaded into blowing up red things. It’s an unnecessary restriction in a game that claims to celebrate freedom. I tested the game on a GTX 970 and an HD 7890. At first the Radeon card suffered from micro-stuttering, but a patch seems to have fixed it. There were no performance issues with the 970. Medici is massive, but there’s no sense of discovery. When you see something in the distance, there’s no mystery about what it might be: it’s almost certainly a load of red things waiting patiently to be exploded. It’s vividly colourful and the geography is varied, but it feels desolate and empty. Your only real interactivity with your surroundings is destroying it. And when you’ve successfully destroyed something, it’s gone forever, removing that interactivity. Gliding around with your wingsuit is exhilarating, but overall it’s a disappointingly lifeless, unconvincing world. It’s not a bad game: just an underwhelming one. There are moments of wonderful, anarchic chaos that make you feel like the world’s coolest action hero. And it’s an amusing physics playground, letting you tether objects with your grappling hook cable and tighten it to violently smash them together. But these things, as fun as they are, can only hold your attention for so long, and boredom soon sets in. All the massive explosions in the world can’t hide the fact that Just Cause 3 is marred by busywork and simplistic design. But maybe you don’t care about any of that, and you just want a simple action game you can fire up for an hour every other day to explode things. Reducing Medici to smoking rubble is undeniably cathartic, and it provides plenty of cheap, instant thrills. But anyone who wants anything more will be disappointed. Who knows what will happen when the modding community gets their hands on it, but for now, Just Cause 3 struggles to compete with other open-world games released this year.